Cushion Solution is a temporary ring sizing gel that reduces your ring size for a more secure and comfortable fit. Unlike metal ring guards, this do it yourself option is far more affordable and won’t scratch your ring. Does your ring turn or slip off because it’s slightly too large in size, are you constantly adjusting it so your stone faces up correctly? Start wearing your rings more comfortably with the use of Cushion Solution. The gel like material dries clear making it nearly invisible, unlike metal ring guards that are bulky and can scratch your ring or snag your clothes. 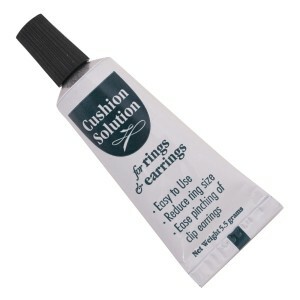 Cushion Solution is safe to use on metal rings and clip earrings. 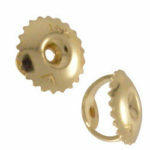 Cushion Solution can also be used to ease the discomfort often caused by clip earrings pinching your earlobes. It is very important that the surface of your ring is clean (free of all oils and residue) and dry before applying Cushion Solution. You can use isopropyl rubbing alcohol to clean the surface of your ring, but make sure you allow enough time for drying. Gently squeeze the tube so the solution starts to flow out. Be careful not to over squeeze or the solution will continue to spew out after you set down the tube. Place the solution on the lower inside ¼ portion of your ring. Once you have placed enough solution, use the side of the tubes funnel or even a paper clip to shape and smooth out the solution. Do not use your finger to smooth out the solution. Add more solution as needed until you have reached your desired size cushion. Use a dry cloth to wipe off any access solution that may end up on the side of your ring. Clean the tubes funnel with a dry cloth and place the cap back on. Wash hands thoroughly after use. Dry in a vertical position for at least 24 hours. Scrape off any dried excess with a fingernail. Try the ring on for size. If you made too large of a cushion, use your fingernail to peel away the cushion and start over at step 1 by creating a smaller cushion. Once fully dried the solution will last anywhere from 2 weeks to 2 months, without having to reapply. 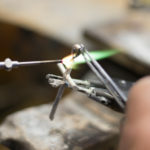 The lifespan of it staying on your ring will depend on the amount you remove your ring or get your ring wet. If your finger size changes, the material can be peeled away from the inside of your ring and re applied as needed. Read directions and precautions before using this product. KEEP OUT OF REACH OF CHILDREN. Do not use this product if you have sensitivity to silicon products. Avoid contact with eyes (If product gets in the eye, flush out with water for at least 15 minutes. Seek immediate medial attention if irritation persists). If the solution comes into contact with skin while applying, wash immediately with soap and water. Use in a well ventilated area. Close cap securely after use. Solution will have a mild ammonia odor. Wash hands thoroughly after using. DO NOT TOUCH FACE OR EYES WHILE USING THIS PRODUCT. Store away from heat in a dry area below 80˚F. CONTENTS: Hexamethydisilazane, Methyltrimethoxysilane, Octamethylcyclotetrasiloxane.